Kiss ME provides a novel way of transferring a mediated kiss remotely through real-time interactive media. It provides a hi-fidelity physical interface enabling kiss communication for several applications facilitating social communication and intimate human telepresence with both the real and virtual worlds. For humans, kissing is the simplest act of social affection, yet it can be the most sensual and loving act of all. Kissing also plays a crucial biologically motivated role in allowing prospective mates to smell and taste each others pheromones for detecting compatibility. With the aid of wireless digital communication media and advanced robotic technology, the system takes the form of an artificial mouth equipped with highly sensitive pair of life-like lips that provides the convincing properties of the real kiss including pressure and temperature. 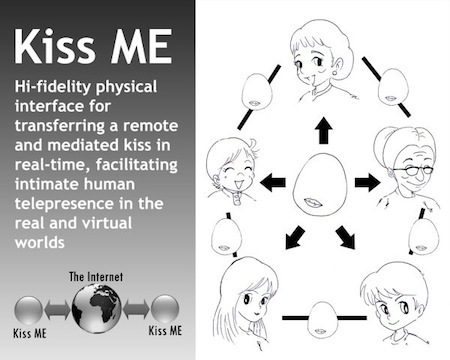 Read more details at Kiss ME : A Novel Device for Kiss Communication .